Each year we host an international design competition called ONE Prize to promote green design in cities. Last year competition attracted 202 teams and 850 team members from 20 different countries in 5 continents. 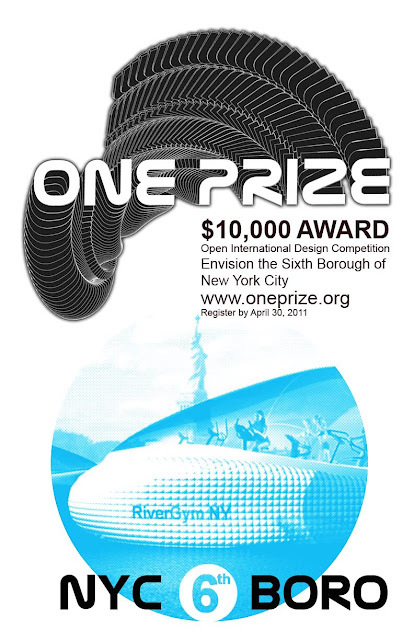 One Prize was named # 4 Design Competition in 2010 by Archinect. The ONE PRIZE committee invites the most talented and imaginative architects, landscape architects, urban designers, planners, engineers, scientists, entrepreneurs, economists, artists, students, and individuals to propose ideas for the NYC Blue Network and The World’s Largest Clean Tech Expo in 2014. These propositions should include; expanding waterborne transportation, linking the five boroughs with transit hubs, incorporating ferries, water taxis, bike shares, electric car-shares, electric shuttle buses, providing in-water recreation, educational events, cultural activities, pavilion halls, and climate resilience. Participants stand to gain a $10,000 grand prize, book publication and prominent year-long exposure through our website and media sponsors.